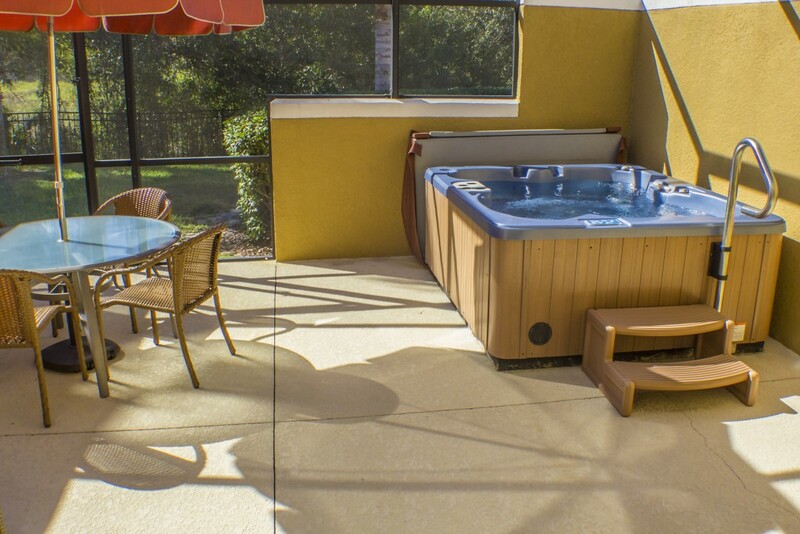 Small family or group looking for somewhere to stay that’s close to Disney World? Look no further! 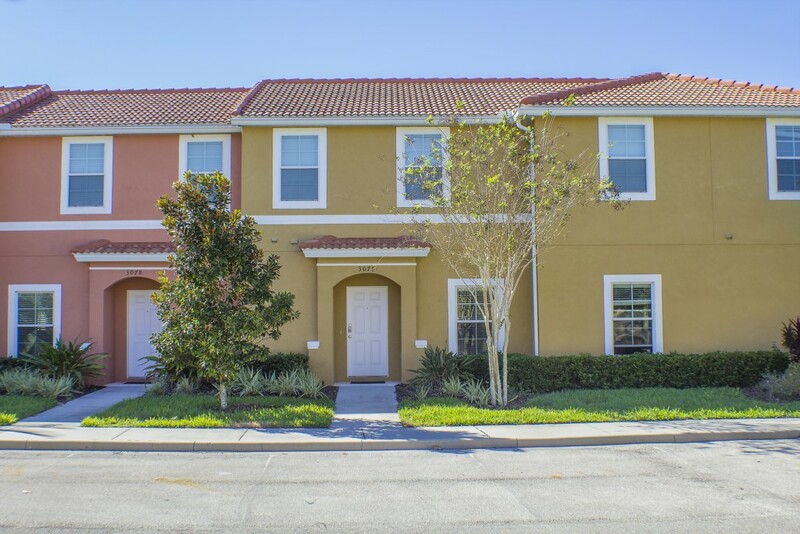 This townhouse is located in the Encantada Resort, has 2 bedrooms, 2.5 bathrooms, sleeps up to 6 people, and is located less than 5 miles from Walt Disney World! 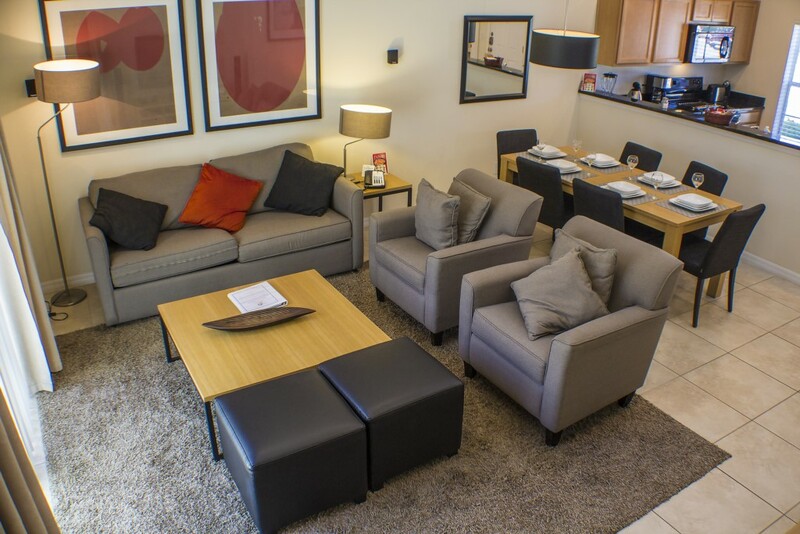 If you like the modern look, you’ll like it here. 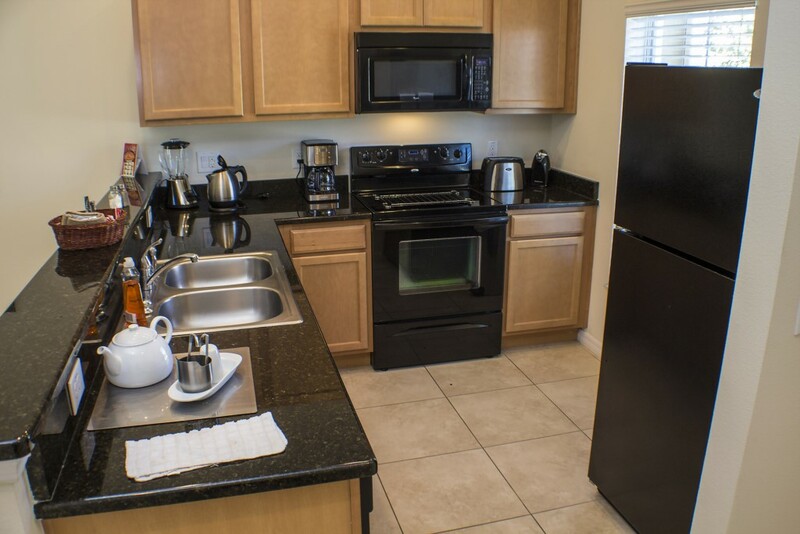 The L-shaped kitchen while small, is practical and has granite countertops, black appliances, a kitchen bar, and all the utensils and equipment you could need when whipping up a great meal. 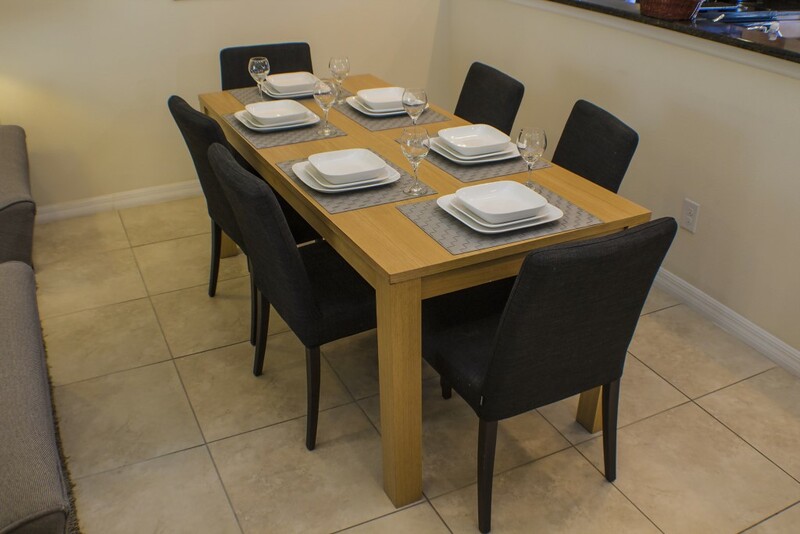 In front of the kitchen is the dining area, which provides a formal place to eat for up to 6 people. In front of the dining room is the living room area. Here, there’s a sofa (opens into a sofa bed) and two arm chairs along with a large, wall-mounted flat screen TV and surround sound system, making it feel like you’re in the actual movie. The living room patio door lets in plenty of light and leads to a covered rear lanai that has a hot tub, loungers, and outdoor seating. 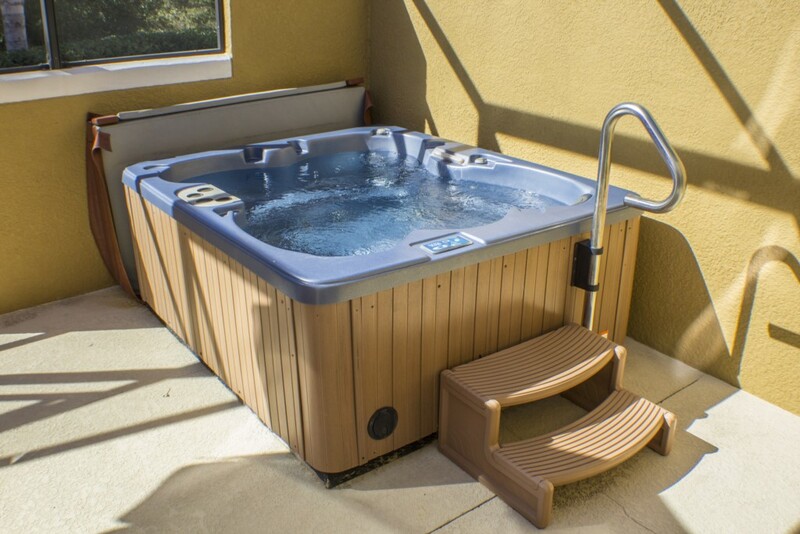 The hot tub comes heated. 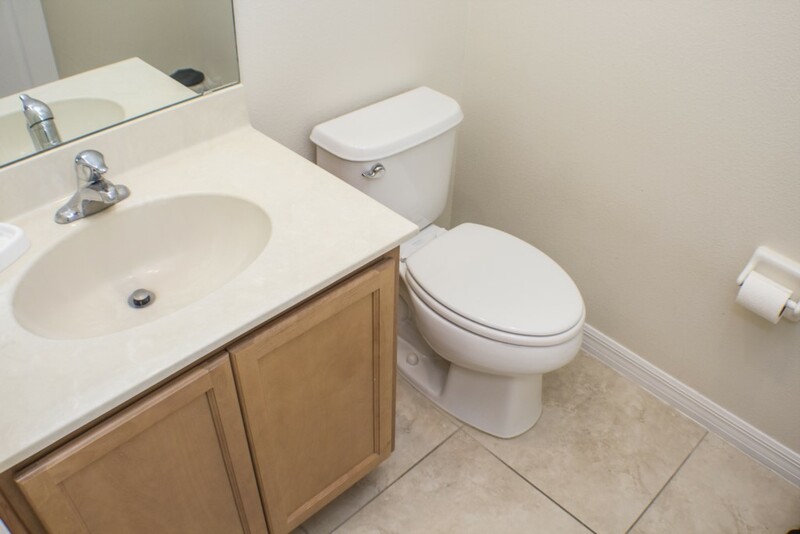 There is a separate laundry room (washer and dryer) and a separate half bathroom. 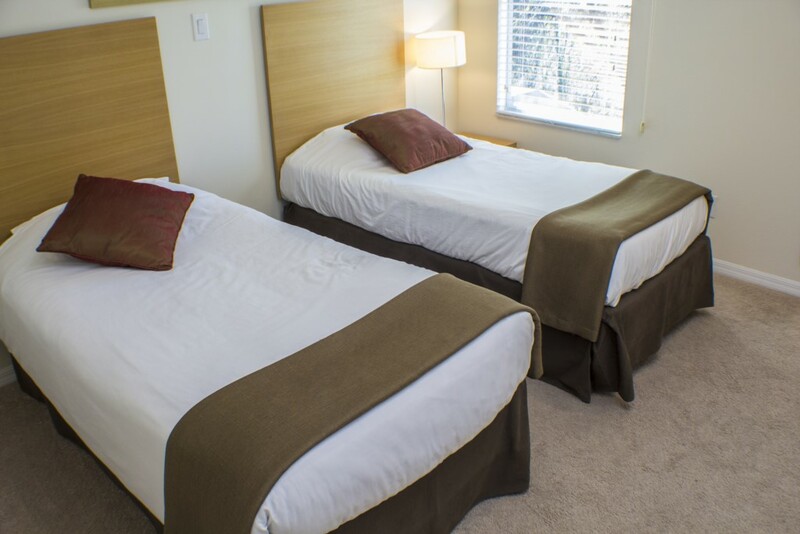 The master bedroom has a king-size bed, en-suite bathroom, TV, and small walk in closet. 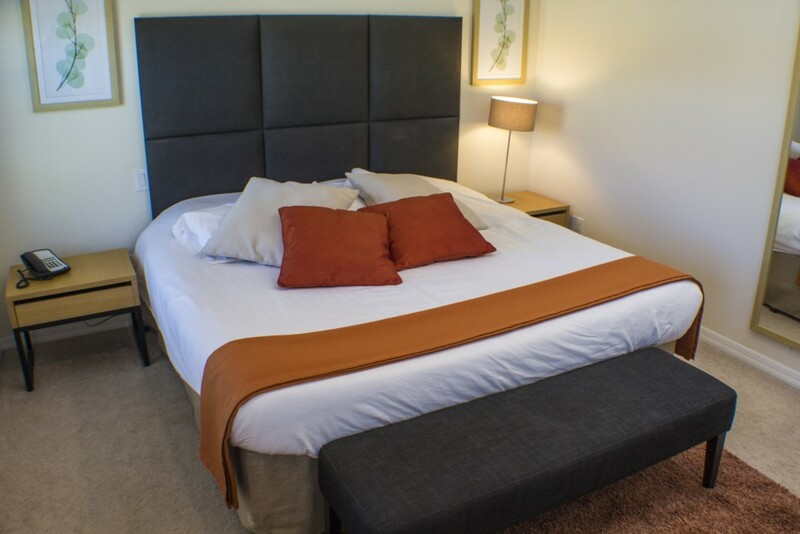 Bedroom 2 has twin beds with an en-suite bathroom. 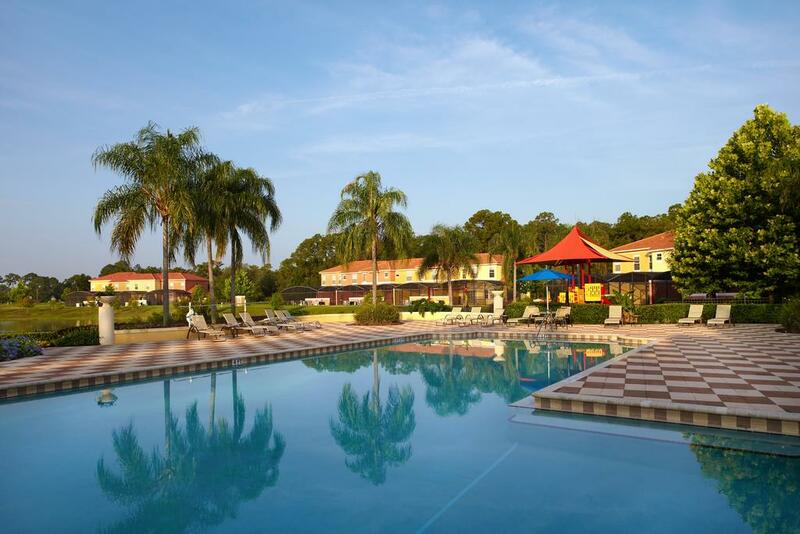 The Encantada Resort is located in the heart of Central Florida, less than four miles from the Walt Disney World entrance. Nine restaurants are located within one mile of the resort. The Disney Village Marketplace offers shopping and dining less than six miles from Encantada. 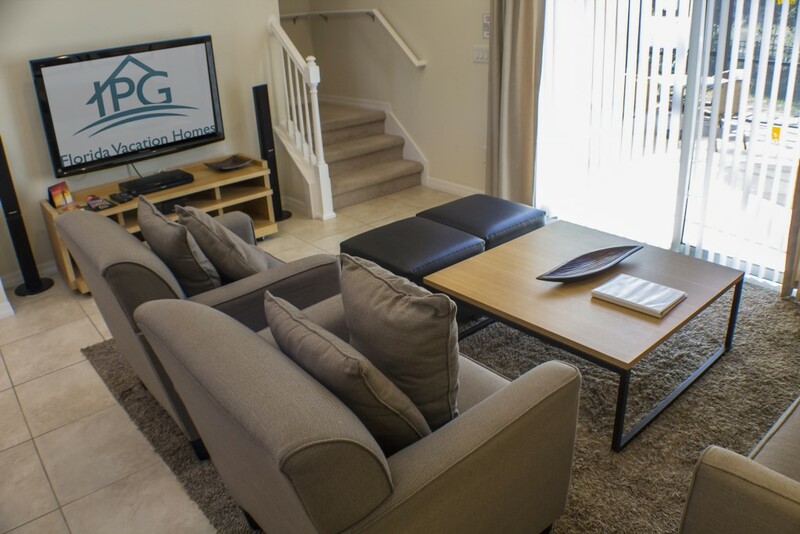 The Highlands Reserve Golf Club is approximately 7 miles away and Orange Lake Golf Club, designed by Arnold Palmer, is only a few minutes away, as well as many other golf courses. The resort features Mediterranean architecture with Floridian accents surrounded by tropical landscape and tall palms. The resort’s 9,000 square-foot clubhouse is open daily from 9am ~ 7pm and features a cybercafé offering computer stations with complimentary high-speed internet access, and a fax and photocopying services. The clubhouse also features a gym with views over the pool deck and lake, pool table, tiki bar, Salamander’s Bistro with pool side serving hatch, game room and a gift shop with sundry section. 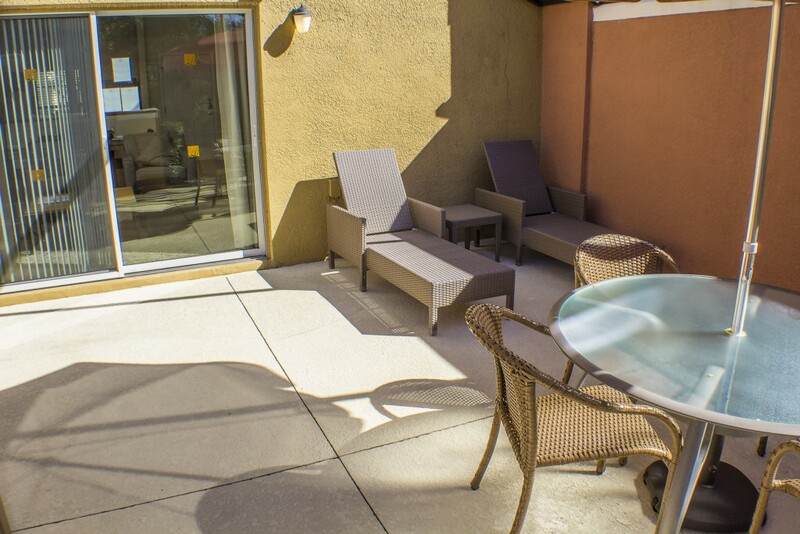 There are two outdoor pools with one for kids, spa tub and kids’ playground. A gazebo with fishing deck overlooks the Encantada Resort’s gorgeous private lake with its own fountain. Guests may also hire the Bistro and/or terrace deck for private functions. Walt Disney World features four magical theme parks and 2 water parks. The Magic Kingdom Park, Epcot, Disney – MGM Studios, Disney Animal Kingdom and Disney Blizzard Beach and Typhoon Lagoon are within ten miles of the resort. 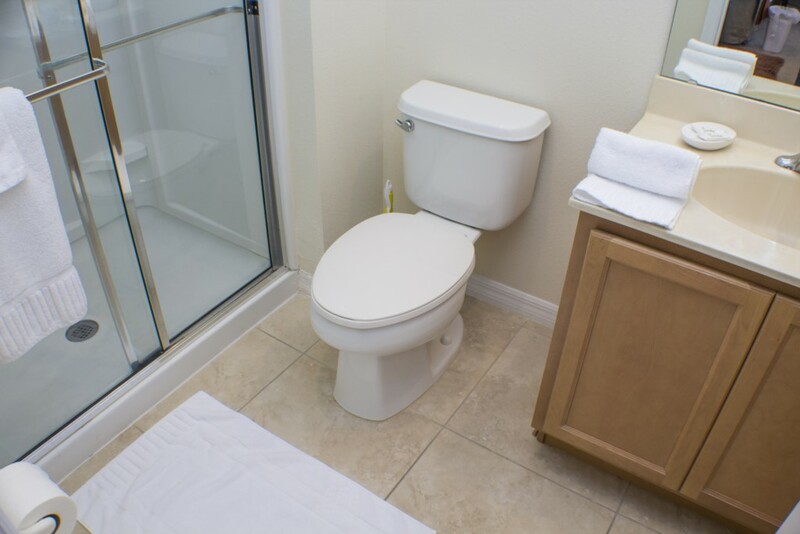 World famous International Drive, Sea World and Universal Studios are within a 20-minute drive. 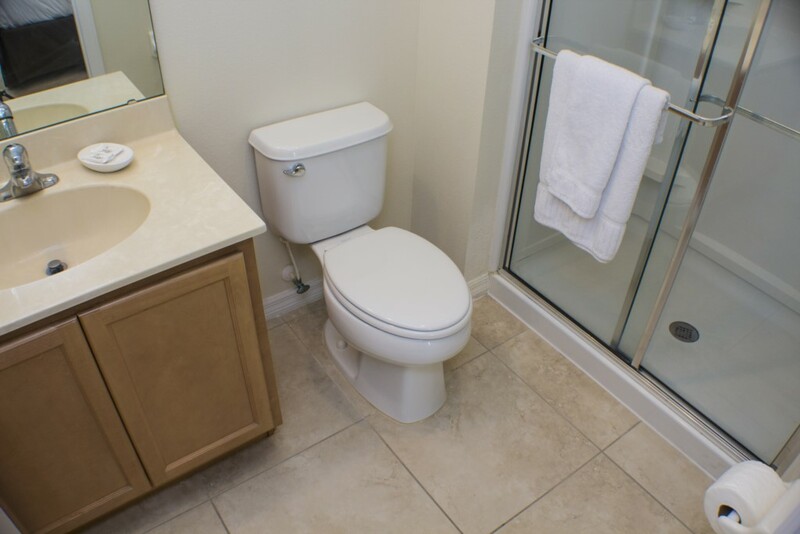 It’s also a very close and has easy access to I-4 that takes you either east to the Space Coast or west to the Gulf Coast.